Sunday night we drove up to the Sandia Crest (for those of you not from Albuquerque, that’s the top most point of the mountains on the east edge of town) to watch the sunset. There’s a great viewing area and tons of great trails. But on Sunday we were not there for hiking, just sunset watching. We’ve lived in Albuquerque 10 years and frankly, I’m surprised we’ve not done this before. My parents are in town this weekend we thought a sunset watch sounded like a great idea. The desert sunset did not disappoint. The light was phenomenal. And while the sunset was lovely, the view in the opposite direction, behind the mountains, was especially amazing. 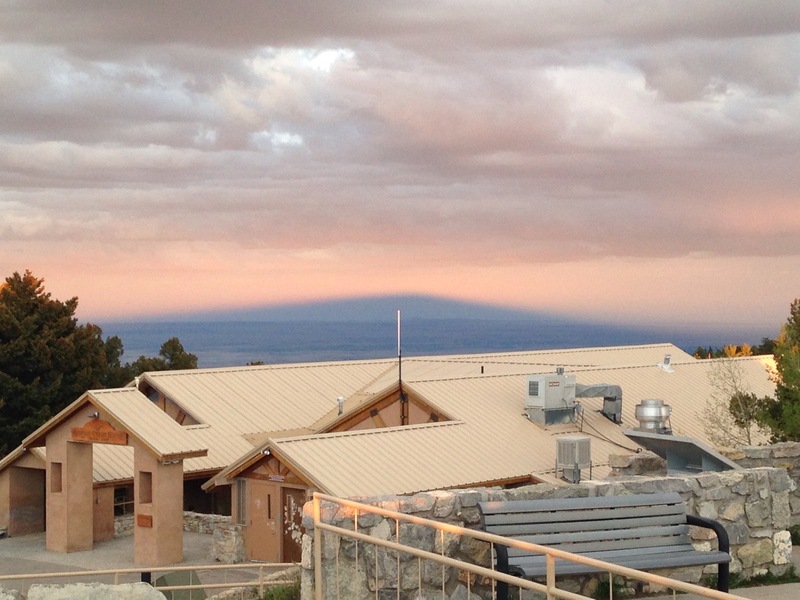 Check this picture out, it’s the shadow of the mountain on the clouds. See the dark semi circle that looks like a hill? That is actually a shadow on the clouds in the flatlands on the backside of the mountain. Really, you had to be there but trust me, it was cool.